Edward Gordon Craig was an important actor, designer, director, and theoretician of the early 20th century European stage. Edward Gordon Craig was born in 1872. He was the son of Edward Godwin, an architect who also did stage designs, and Ellen Terry, one of the most revered actresses of the English stage. Craig's own stage career began at the age of 12 when he appeared as a gardener's boy with his mother at Henry Irving's Lyceum Theatre. At 17 he was accepted into the Irving company, and for the next ten years Craig's primary interest was in acting. Despite Craig's successes as an actor, he ended that career at the age of 25. Part of the reason for this early retirement was Craig's belief that his idol, Henry Irving, personified the best in acting and that he, Craig, could contribute nothing more to the stage than a copy of Irving's style. From his mentor Craig had learned valuable theater lessons such as strict discipline in rehearsal; thorough rehearsal for a production including the actors, the lighting, and the technical elements; and attention to detail. Although these things seem standard today, they were innovations to early 20th-century theater. Another reason that Craig left acting was his distaste for realism—the imitation of life—which was the predominant style of the period. As early as 1893 Craig had begun to experiment with music and woodcuts retaining only dominant forms and masses. He believed that art was not an imitation of life but rather an expression of the inexpressible. Surprisingly, Craig's first work as a director, No Trifling with Love (1893), at the Uxbridge Town Hall, was executed in the style of historical realism. However, by 1899 he had developed his own form of theater which he displayed in his first major work, a production of Dido and Aeneas. This innovative production took eight months of rehearsal, included a cast of 80, introduced totally new lighting techniques, and completely broke from the realistic tradition. Designed, directed, and choreographed by Craig, the production evoked atmosphere and emotion rather than simply revealing time and place. In Craig's next production, The Masque of Love (1901), he continued to develop his style, using three large cloths as the basis of the entire set and sacks stitched together for the costumes—again simplicity and mass created the entire illusion. 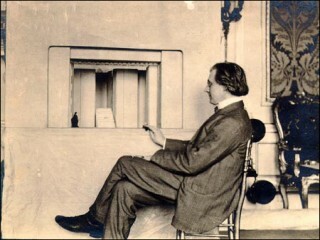 Edward Gordon Craig's practical work was not extensive, yet it helped to revolutionize the theater's growth in this century. In 1902 he directed and designed Handel's Acis and Galatea; in 1903 he presented Bethlehem and two productions which his mother acted in and produced, The Vikings and Much Ado about Nothing. For several years Craig collaborated with other theater innovators, including Otto Brahm, Max Reinhardt, and Eleanora Duse. One of his most famous projects was a co-production with Stanislavsky (perhaps the most influential theater director/actor of the 20th century) of Hamlet (1912). This production, known primarily for its revolutionary setting of large moving panels, perhaps reveals the reasons that Craig left the practical theater world. Aside from his difficulties with personality conflicts (Craig was known as an eccentric), his ideas were far ahead of his time. He believed in the director as the ultimate creator, one who must initiate all ideas and bring unity to a production. He created the idea of the actor as "ubermarionette," whose movement was not psychologically motivated or naturalistic, but rather symbolic. The actor should be like a mask for the audience to interpret. Finally, he introduced a new stagecraft—one based on the magic of imagination rather than on everyday details. If Craig's actual work was limited, and sometimes impractical because of technical limitations, his writing was prolific. In 1898 he launched the theater journal The Page; in 1908 The Mask (until 1929); and from 1918 to 1919 he wrote The Marionette. He also published The Art of the Theatre (1905), On the Art of the Stage, Towards a New Theatre, Scene, The Theatre Advancing, and Books and Theatres, as well as biographies of Henry Irving and his mother. Craig's work in the theater and his writings have influenced many of the 20th century's innovators, including Stanislavsky, Meyerhold, and Brecht. He continued to be a source of inspiration for many years—many of the ideas that he developed in the early part of the 20th century were not realized on the stage until the 1980s. Edward Gordon Craig died at the age of 94 in 1966. View the full website biography of Edward Gordon Craig.